Happy Friday, folks. Is everyone in a funk from last night's Cavs game and the hoopla in Downtown? I'm ready for the weekend, and for some Browns' fun with my brother and his girlfriend. Build-your-own fajitas are on the menu, and let's hope for a win. Speaking of sports, I am a member of the local chapter for Women in Sports and Events (WISE). WISE Cleveland strives for empowerment and career advancement through socialization, education, networking and mentoring programs and events. I've been a member since I moved to Cleveland almost seven years ago, and I am currently serving in my third term on the Board of Directors. It's an organization that has provided me with genuine personal and professional relationships, business opportunities, and a wealth of education through our monthly programming. I also benefited from the WISE Within one-on-one mentoring program when I was first starting out in Cleveland, and I served as a Mentor for the first time year. I believe strongly in the organization. The membership is greater than the name implies. We have approximately 150 members from career areas like special events, sports management, non-profit administration, marketing/communications, sales, media and more. The access that members have to networking and educational opportunities, both locally and WISE nationally, is invaluable. I'm at my current job because of WISE! If your current job or interest in a particular field even remotely touches on one of these areas, then I highly suggest checking out WISE at www.wisecleveland.com. I have an in-person opportunity for you to do that, while checking out a new restaurant. Driftwood Catering (the guys behind Hodge's, Washington Place Bistro, Cibreo, etc.) have opened Sanctuary in the Hilton by Doubletree in Beachwood. 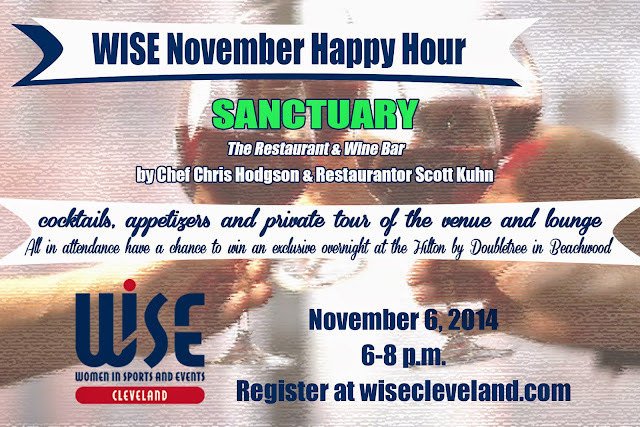 WISE Cleveland is heading there next week for cocktails, appetizers, and a private tour of the venue and lounge. All attendees will be entered to win an overnight stay at the hotel. It is from 6-8PM. The event is free for WISE members, and just $15 for non-members. WISE Cleveland is generously giving away two tickets to this event to a Bite Buff reader. Come check out the new restaurant, meet some incredible women, network, and enter the raffle for an overnight stay at the hotel. I'll be there! Just leave me a comment on this post for entry. I'll use random.org on Tuesday at 3:00pm to select a winner. If you are unable to attend the Happy Hour event next Thursday, but you're interested in learning more about the organization and our membership, please visit www.wisecleveland.com or contact me by email. Disclosure: I am a paid member and active Board member for WISE Cleveland. I was asked to post about our upcoming event, and was provided with two tickets to give away. All opinions stated are 100% my own. I hope that everyone in Cleveland took advantage of the gorgeous weather this past weekend! This time last year, we had already experienced snow. "R" and I did by getting some yard work done, and by fitting in a couple of bike rides. We also cooked at home on Saturday and Sunday nights, which felt great. We've been super busy lately, and the next six weeks will be more of the same. We're wedding planning at warp speed, and trying to squeeze in time with friends as well. On Saturday night, we were on a mission to use up a bunch of our Fresh Fork items. We're down to the last few weeks of the summer share, and we still have several items to use up. This recipe, adapted from the most recent issue of Cuisine at Home, took care of four, and it was quite tasty if you enjoy the flavor of peppercorns. Coat both sides of the pork chops with salt and the peppercorns. Heat oil in a saute pan at medium-high heat until it simmers. Add pork chops and sautee until browned (about 2 minutes per side). Transfer pan to oven and roast pork until meat reads 145 degrees (about 8-10 minutes). Transfer pork to plate and tent with foil. Deglaze same pan with brandy. Cook at medium-high heat until liquid nearly evaporates (about 2 minutes). Add broth, vinegar, and thyme to pan, and reduce (4 minutes). Off heat, whisk in butter. We wanted to use up more Fresh Fork items from our weekly bags, so we used some Ohio City Pasta garlic scape linguine as a base for this dish, and steamed some broccoli as a side. The peppercorns have quite a bite to them, and a little heat, but we both love that flavor, so it worked for us. The pasta was a perfect pairing, and we enjoyed this last-minute dish that we had created. The Alton Brown Live! The Edible Inevitable Tour is coming to PlayhouseSquare next Friday, November 7th at 8:00PM at State Theater. "Alton Brown Live! The Edible Inevitable Tour" features a pinch of comedy, talk show antics, a multimedia lecture, live music (he sings!) and a dash of extreme food experimentation! Renowned "foodist" and TV personality Alton Brown is familiar to viewers for such food series as "Iron Chef America," "Good Eats," "Cutthroat Kitchen," and "Food Network Star." The James Beard Award winning author of seven books, Brown created, produced and hosted the Peabody Award-winning series "Good Eats" which ran for 13 years on the Food Network and now can be seen on the Cooking Channel." Alton Brown will bring his brand of quirky humor and culinary-science antics to the stage. The two-hour show is a unique blend of stand up comedy, food experimentation, talk show antics, multimedia lecture, and, for the first time...live music. Tickets range from $35 to $125. The $125 tickets include a pre-show meet and greet with the star. You can purchase them online here. Or, you can WIN TWO TICKETS by entering my giveaway. Use the Rafflecopter below for several ways to enter. I'll select a random winner on Tuesday, November 4th. Disclosure: I was provided with four tickets to the show, two for myself and two for a giveaway, from PlayhouseSquare in exchange for this post. All opinions are 100% my own. Chef Partners Steve Schimoler (Crop Bistro owner) and Matt Anderson (formerly of Umami Asian Kitchen) have opened the doors of the new Crop Kitchen in the east-side Uptown neighborhood. The menu feels like a blend of the two, with some familiar Crop Bistro (sister restaurant in the Ohio City neighborhood) specialties, with sushi and a few crowd favorites from Umami sprinkled in. We saw Crop's signature Cherry Bombs and Popcorn, and Umami's Goat Cheese Dumplings ($8), just to name a few. We had perched ourselves at the "chef's table" sushi bar this weekend, and had a great view of the workings of the kitchen, and a front-row seat to the sushi rolling. As "R" stated, "I wouldn't want someone staring at me while I worked." Yes, this open-kitchen layout certainly puts all eyes on the staff, but it was pure fun to watch them work. We also had a chance to chat with Chef Matt, whom I've known since I moved to Cleveland almost seven years ago. We joked about the fact that Umami's entire restaurant could fit into the size of the new Crop's kitchen space. I'm sure it's going to take some getting used to, but he was handling it well. Matt rolled us a complimentary Salmon and Goat Cheese roll (all rolls are $10), and we also ordered some sashimi later on (3 pieces for $12). For now, the restaurant is offering three kinds of rolls, and three kinds of sashimi, with plans to expand that section of the menu later. It doesn't feel like the restaurant changed too much in the layout from the previous restaurant's concept (actually, look up at the ceiling to still see the Accent letters), but Crop has certainly put its signature stamp on the place in some ways. Warmer colors, food art on the wall, and playful accents like these colander lamps. The cocktail menu also has several tempting choices. I just had a glass of wine, but "R" went for the Mr. Figgy with fig-infused bourbon, sweet Vermouth, maple bitters, and bruleed bacon. I stole a bite of the bacon, and it was divine. Welcome to Uptown, Crop Kitchen! We'll be back for more. I'm really a fan of the new(ish) Platform Beer Co. on the corner of Lorain and West 41st. We stopped in for just a beer the first time, but now I've been back for two meals. They just happen to both be brunch. As I mentioned in my last blog post about the new bar, they are not providing their own food. They have recruited a rotating roster of local restaurants and food trucks to pop in one night a week to provide food for Platform patrons. On Saturday, they have The Grocery. The menu is simple. Build your own omelet, crepe, or bagel sandwich. The amount of components being used that are sourced from local vendors is impressive. I spotted: Cleveland Bagel Co., Saucisson, Clark Pope, Randy's Pickles, Brewnuts...just to name a few. During my first Brewhouse Brunch, I tried a BYO bagel sandwich. You have your choice of bacon or sausage, cheese, and many vegetables and additions to choose from. I kept it simple, with just bacon, egg, cheddar cheese, and jalapenos. I also requested a side of blackberry jam, which was an amazing addition. It was seriously messy, but oh so delicious. I also couldn't resist the build-your-own Bloody Mary bar. I'm a sucker for them every time. You get to pick from a couple of vodka flavors. I selected the Cilantro Jalapeno. They offer a couple of different mixes, several hot sauces, classic additions, and several locally sourced munchables to add. My only complaint? No shakers or stir sticks provided, and I had to stir it all together with my straw, which didn't work very well. This past Saturday, I met two friends there for a second brunch visit to Platform. I started with a Bloody Mary again, this time going with the Cilantro Lime vodka. Still no shakers or stir sticks, but they did switch up the presentation of meat and cheeses to add, by pre-building skewers for you. Very easy to grab and add to your drink. 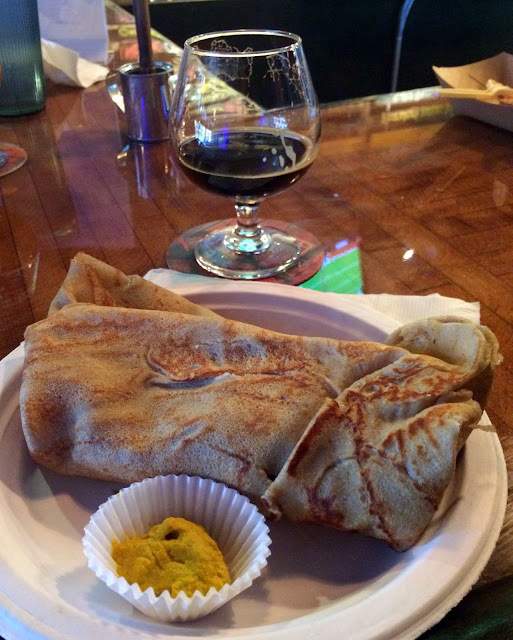 For food, I chose the build-your-own Buckwheat Crepe this time. I had selected sausage, cheddar cheese, chard, and blackberry jam. I'm hooked on that blackberry jam. Other than the fact that it was packed with too much chard, it was enjoyable. Although, a bit more cheese would have helped hold it all together, because it was a tad dry and the pieces and parts kind of fell apart when I cut into it. While good, the bagel sandwich had been better. Not pictured was a Brewnut donut, soft, glazed, and topped with a raspberry beer frosting and chocolate chips. My first bite of a Brewnut, and I liked it! Also, we each started a tab by providing a credit card when we arrived. When we were ready to leave, the bartender ran the cards provided, and we were never presented with itemized checks. From the amounts, we were pretty sure that something was incorrect on our bills, but it wasn't worth trying to figure out what had happened. The food and drink prices are reasonable, and our checks weren't high, considering the fact that we had sat there drinking and eating for over two hours. But, I hope that this was a fluke, and that itemized checks are presented to patrons. Our bartender was less than stellar on Saturday, in general, so it wasn't surprising. All brunch options are $7.99. The Brewhouse Brunch is offered every Saturday from 10AM - 2PM. I was also thrilled to see Founder's Breakfast Stout on tap during this trip! Never a bad way to kick off a boozey brunch. Platform is doing alright, in my book. We'll keep stopping in. Have you been to Platform yet? While there is no "Pause" button, I can certainly find areas of my life that can be put on hold when I have to focus time and energy on other things. This blog is about to be one of those areas. You'll still hear from me. I already have some recent dining adventures to share with you, and there are sure to be more in the near future. However, I may not be posting as regularly here for a bit. Because..."R" and I are tying the knot! In just 8 weeks time. Yes, I'm going to plan and throw a wedding within that crazy time frame. If anyone can do it, I can. I throw large events for a living. But, that doesn't mean that it won't be stressful, and that there isn't A LOT to do in the short amount of time. No, I am not pregnant, and this is not a shotgun wedding. Hehehe. 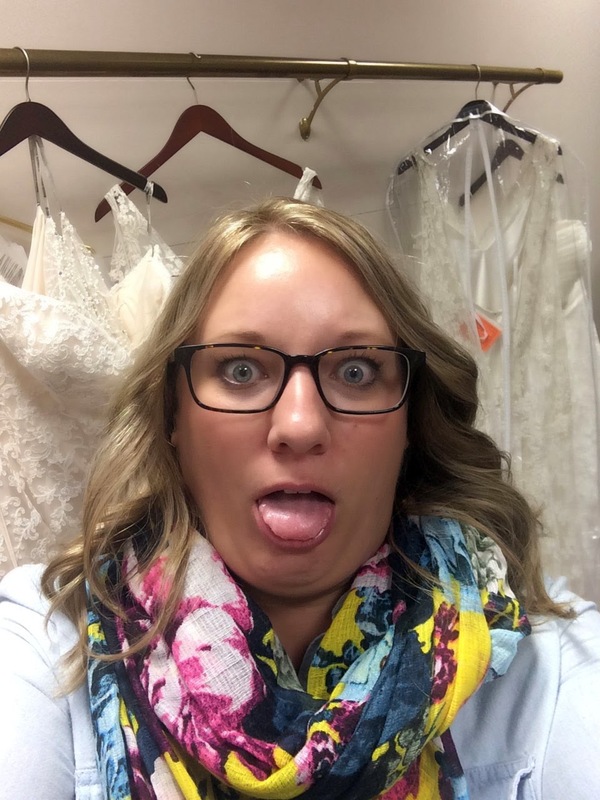 So, while I bury my nose in wedding planning, please excuse the "Pause" over here on the blog. If you're looking for a nice brunch spot in Downtown Cleveland, they are few and far between. But, Urban Farmer Cleveland's Steakhouse is trying to change that. On Saturdays (bonus!) and Sundays, from 8AM - 3PM, they are offering brunch. I think it could use a few more hot sauce options, but it did have plenty of house-pickled items to choose from. The menu proved to be full of tempting items, and it was kind of hard to choose. "R" ended up with the Red Flannel Hash with corned beef, beets, fingerling, ramps, and poached eggs. Tasty, and fun way to incorporate beets into brunch food, but the portion was small for the price and the corned beef was hard to find. I went with the Cheddar Bacon Biscuit with a fried egg, sausage gravy, crispy chicken leg, and lemon marmalade. It also wasn't cheap, but the portion size was generous and I left very full. The top part of the biscuit was almost unnecessary. I put it aside, and schmeared some jam on it. The brunch was certainly a treat, and it's nice to see a good option in Downtown now. Just be prepared to splurge for this meal. Not unlike their dinner service. However, I think Urban Farmer is a great addition to Downtown, and we're already looking forward to a return visit with friends for dinner next week! Any Downtown brunch locations that you enjoy? As we've been exploring Old Brooklyn on our bicycles, we had one stop that was on the "must-try" list. After reading about Pupuseria Katarina in Scene, I was dying to try it. It was located just minutes from our house, and I'd never had Salvadoran food before. The restaurant sits back from the road, nestled in between a couple of other run-down looking businesses. Plenty of parking in the lot in front of the restaurant. It is about a half mile north of the Broadview-Brookpark intersection. The small place was clean and inviting inside, with music playing, flowers on the table, and a warm greeting when we entered. We were left to browse the menu, and plenty of it sounded tempting. But, we were there to try the griddle-fried pupusa. They are inch-thick corn pancakes stuffed with various fillings and fried on a griddle. They are each just $2. We were stuffed after splitting six of them, and walked away with a bill + tip for under $20. Dining Deals Alert! We tried the Garlic, Jalapeno, Cheese, Pork, Spinach, and a specialty one that included a native flower (I forgot the name, sorry!). Pupusas are always made and fried to order, and served with crunchy cabbage slaw and a thin, mild tomato sauce. We told our server that we like spicy things, so he provided us with a jar of pickled vegetables that had some kick to it. The only one that we didn't care for was the Jalapeno. It was packed with fresh, diced jalapeno, and the spice level overwhelmed everything else. What a find in our neighborhood! A great spot for unique, comforting food at a steal of a price. One thing that I truly love about our area is that there seems to always be great businesses popping up, related to food. 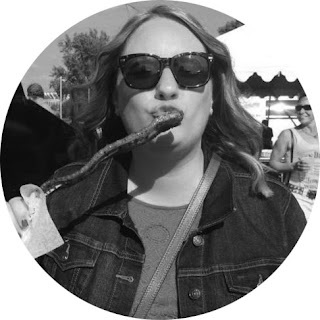 From food trucks, Randy's Pickles, meats from Saucisson, and other products showing up at farmers markets and from the Cleveland Culinary Launch and Kitchen...there's always something to discover and taste. Today, I want to tell you about Cookie Love Bake Shop. It is a home-based bakery, located in Hudson, Ohio that specializes in fresh-baked gourmet cookies. Serving Summit, Portage, and Cuyahoga counties, they are delivering. Which is a great way to send a treat to someone, or to have baked goods just magically appear at your door! The owner contacted me by email, to see if I'd be interested in sampling her cookies. "R" would have killed me if I had turned down this offer, so just a few days later, a box of a dozen cookies arrived. The box included Chocolate Chip, Fudge Chocolate Chip, Peanut Butter Chocolate Chip, and Oatmeal Raisin. All four kinds were very soft, and two had just a sprinkle of sea salt on them (which I loved!). "R" and I were in agreement that the traditional Chocolate Chip were our favorite. This is their signature cookie. The Fudge Chocolate Chip wasn't too far behind. A rich, dark cookie with two types of chips, it definitely reminded me of a brownie. The Oatmeal cookie was the softest of the four. I'm not a huge raisin fan, so the golden raisins weren't really my thing, but the cookie itself had hints of delicious cinnamon and spices in it. The Peanut Butter cookie had three types of chips, which was cool. It was packed with peanut butter flavor, but ended up being my least favorite of the four. The texture was a tad gritty, and it was a little too sweet for me to want to finish it. I think a true sign of how these cookies were is the fact that the entire dozen was gone just 24 hours later. I think we were even down to 3 within 12 hours. I live with a cookie monster, and he happily indulged in these. If you need cookies for an upcoming party, to send as a gift, or you're just craving something home-made and sweet that you don't have to bake yourself, check out Cookie Love Bake Shop. They have a great website, and are pretty active on social media. All cookies are $8.95 for a dozen, and there is a three dozen minimum order. Small delivery fee does apply. You can place orders by phone now, but online ordering is coming soon. Disclosure: I was provided with one dozen cookies to sample, but was not asked to blog about it. All opinions stated are 100% my own. With the cooler temperatures of fall coming in, the squash are starting to pop up at farmers markets and in our Fresh Fork bag. We use them in many ways, but I do love to stuff them. They make a great vehicle for all kinds of mixtures, and are a healthier way to eat some of your favorite flavors. Take this recipe, for example. All of the great American-Mexican flavor, without the calories of tortillas, refried beans, and tons of sauce and cheese. This recipe was adapted from Closet Cooking. Brush the inner flesh of the spaghetti squash with oil, season with salt and pepper. Roast, skin side up, in a preheated 400 degrees oven until tender, about 30 minutes. Mix the chicken, enchilada sauce, beans, corn, cilantro, and Sriracha. Divide the mixture between the spaghetti squash, pressing into the squash's cavity. This looks deceptively bad for you, since it has that bubbly cheese on top, but it's not! It didn't taste nearly as "healthy" as it was. Do you have a favorite recipe for stuffing squash?